Cosplayers, performers, and shenanigans abound- the Anime USA Cosplay Masquerade features them all! The Cosplay Masquerade features cosplayers and costumers alike who come together to show off both skit performances and their craftsmanship in one exciting and entertaining show. Performers are judged for their talent and entertaining a crowd. They bring together their favorite series and shows to life through comedy, dance, drama, or even some internet inspired randomness. Meanwhile, seamstresses and tailors show off their amazing craftsmanship work to bring these beloved characters to life on stage. Participants in our Hall Cosplay Craftsmanship Contest also join us show off their hard work with other amazing cosplayers during the Catwalk & Fashion Show portion of the Masquerade. Are you an inspiring or well mastered craftsmanship cosplayer looking to have your work evaluated? Or to put your skills to the test and see how well you measure against your peers. Read our rules and pre-register today! 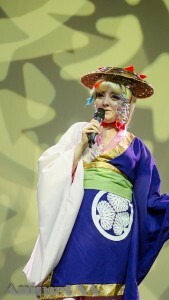 Are you a cosplayer who is interested in doing a skit performance on stage? All cosplayers are invited to participate regardless of you made or purchased your costume. If this interests you, be sure to learn more about the Cosplay Masquerade.